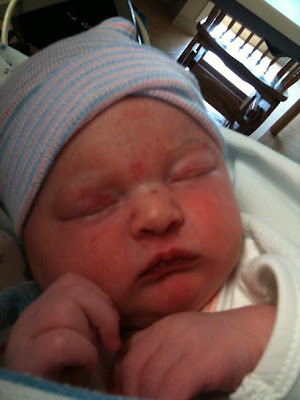 Life with the Lashers: Welcome Isabella Eve Lasher! We are happy to announce that Isabella Eve Lasher graced us with her presence on April 5, 2010 at 11:30am at Brandon Regional Hospital! She weighed 8 pounds 3 ounces and measured 20 inches long... a very healthy little bundle of joy! My last day of work was April 2nd and my first (and only day off) was April 3rd. We spent the entire weekend "nesting" and finished every project we set out to complete by Sunday afternoon. The morning of Easter Sunday was uneventful and we finished installing the car seats in both our cars and went to Easter brunch in Safety Harbor at the Safety Harbor Spa & Resort with Ian's family. The brunch was amazing and I indulged in everything from fruits & vegetables to desserts... and let me just tell you, the desserts were delicious! Ian's family decided to take a walk around the resort, but I was feeling tired and swollen, so we decided to return home. We worked around the house and finished the nursery by early afternoon (thank goodness) and relaxed during the early evening. Little did we know that I was in early labor the whole time! My back was killing me and despite my efforts to combat my back ache with Tylenol, a warm bath and massage, the back ache wouldn't go away. I started having cramps around 6:00pm and thought I had simply overdone it. I even took two baths that evening because I was feeling so uncomfortable. My frequent trips to the bathrooms increased and seemed different than before. At about 10:00pm my trip to the bathroom yielded blood in the toilet (sorry, TMI) and it was at that moment I decided we needed to call the OBGYN. I called Dr. Champion, told her my symptoms and she instructed us to go to the hospital. I wasn't certain that I was truly in labor, but I knew that something wasn't right. We checked into to Labor & Delivery around 11:00pm and I was promptly checked by a nurse. I was hooked up to monitors and my cervix was checked and sure enough... I was in labor! I was approximately 3-4 cm dialated and having contractions approximately every 10 minutes. Not too long after I was checked, I was offered an epidural, which I gladly took. The epidural insertion wasn't painful at all and despite an unsuccessful first attempt to insert the epidural, within minutes of the successful second attempt, I was feeling relief from the contractions. I attempted to sleep that night, but I was obviously very excited and found it difficult to stay asleep. I watched TV, used Facebook to pass the time and maybe even slept for an hour or two. By morning, my contractions had slowed down due to the epidural and the Pitocin was started. I was nervous about receiving Pitocin because I was afraid it wouldn't work OR that it would work too well. My body reacted well to the Pitocin and my contractions became stronger and more frequent. It was at this point that I began feeling the contractions again and so I asked for more pain medication. I was given additional pain medication and continued to progress as expected. By 9:30am, Dr. Vanegas came to check my cervix and promptly told me that it was time to start pushing. With the assistance of the nurse, I began pushing around 10:00am but honestly wasn't giving it my all. My mom was en route to Tampa from Baltimore and I had expectations that she would be in the delivery room. I was really numb from the epidural and had a difficult time controlling my legs. The nurse decided that I should take a break and allow the epidural to wear off a little. She returned around 10:45am and I began pushing again. Dr. Vanegas returned and began getting ready for delivery. It was at this point that I became very nervous... I was afraid that I was too out of shape or incapable of pushing the baby out. My fears were quickly calmed as I was told that I was making progress with my pushing. My mom arrived at 11:15am, straight from the airport! I pushed for another 15 minutes and was beginning to feel tired. I wanted her out so very much, that I gave 4 good pushes and at 11:30am, Isabella Eve Lasher was born! I heard her cry, which was a huge relief and I held her on my chest for about 15 seconds before she was whisked away by nurses. It was at this point that all hell started to break loose... luckily it was regarding me and not Isabella. After I passed the placenta, Dr. Vanegas began stitching me up and that seemed normal to me. She began massaging my uterus from the outside because I couldn't stop bleeding. The "massage" hurt worse than the contractions and giving birth and I wanted it to stop. Apparently this was the least of my problems, as I continued to bleed. The mood in the room quickly turned from warm and fuzzy to hectic and concerned. I remember looking down and seeing nothing but red. Red gloves, red gauze... red, red, red. Dr. Vanegas stated that she needed to locate the source of the bleeding and if she could not, she would need to perform a D&C. I remember hearing the words "D&C", "OR" and transfusion. It was at this point that I became very upset and Dr. Vanegas increased my pain medications and injected Staydol into my IV. The Staydol made me feel very loopy, but I was aware of everything that was going on. The pain subsided for the most part but the bleeding wouldn't stop. The room was filled with people and I had no idea who these people were or what purpose they served. I held onto the nurse's hand the entire time because I was beginning to get scared. I looked over several times at Ian, who was holding Isabella and I longed to hold her again. After all, newborns are supposed to be curled up on their mothers' chests after they're born, aren't they? I never considered the fact that something would prevent me from holding my baby and I was faced with this ugly truth. After about an hour and a half of poking, prodding and two injections of clotting medications, the source of the blood was located. Within minutes, Dr. Vanegas was finished and the mood in the room returned to calm. Ian handed me Isabella, who was swaddled in her blankets and looking absolutely beautiful. She was perfect and she was mine. I wish I could relive this exact feeling I felt that morning each and every day. We were a family; I was a mom, Ian was a dad and Isabella was our daughter. The feeling was surreal and almost dream-like. Sometimes I relive this feeling when I look at her, when I hold her and when I see Ian hold her. So... welcome to the world, Isabella Eve! We're so glad to have you here, we love you so very much and we can't imagine life without you! We can't wait for everyone to meet her because she is absolutely wonderful!